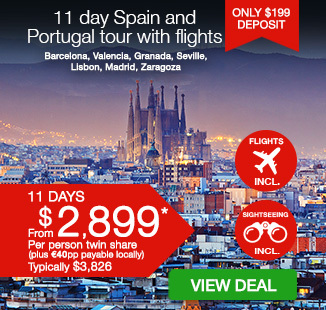 11 day Spain and Portugal tour with return flights, accommodation, in-depth sightseeing, breakfast daily, professional tour manager, transportation and more. per person twin share |	Typically $3,826! 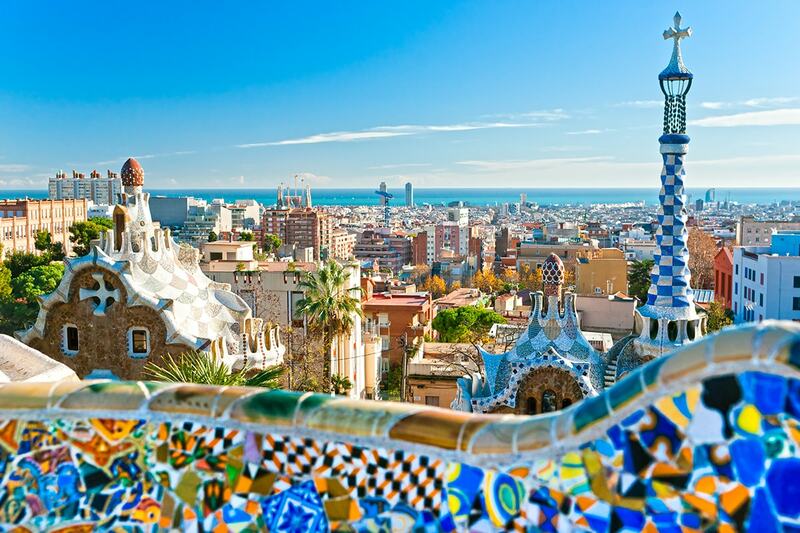 Live the good life with this 11 day Spain and Portugal tour. Indulge in the incredible food, soak up the stunning architecture, wander charming streets, take in the insanely beautiful landscapes and partake in the fiesta – this is a place you can’t help but embrace. 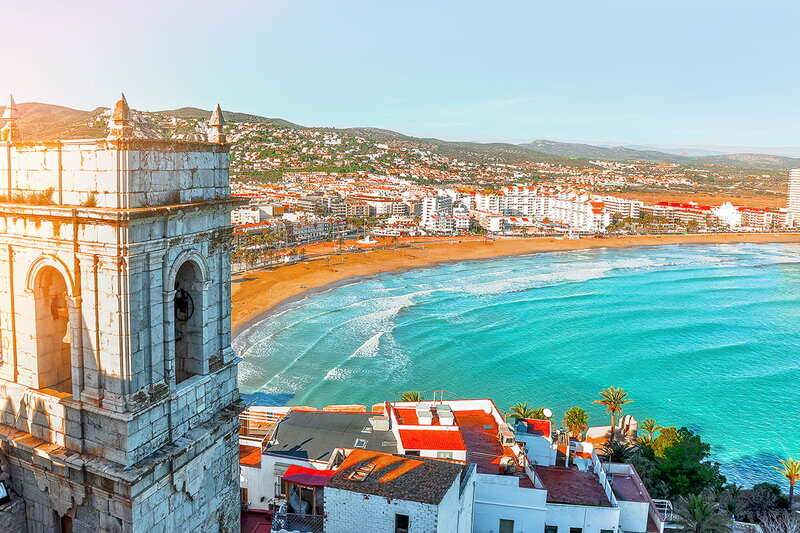 Explore the famous cities of Valencia and Granada, take in the cathedrals and monuments in Seville, enjoy a custard tart in Lisbon, shop for specialty goods in Madrid, see Barcelona‘s renowned sites and so much more. Your package includes return international flights, accommodation, breakfast daily, in-depth sightseeing, professional tour manager, dedicated transportation and more. Depart Australia today to begin your Iberian getaway! On arrival in Barcelona you will be transferred to your hotel. After check-in the rest of the day is at leisure. After breakfast at the hotel, we’ll leave Barcelona for Spain’s third largest city, Valencia. Valencia is celebrated as the gateway to the Mediterranean. It’s commercially and culturally rich, with Moorish culture, customs and food all represented in the cultural blend. Trade allowed Valencia to enjoy prosperity and glory that other Spanish cities didn’t achieve. 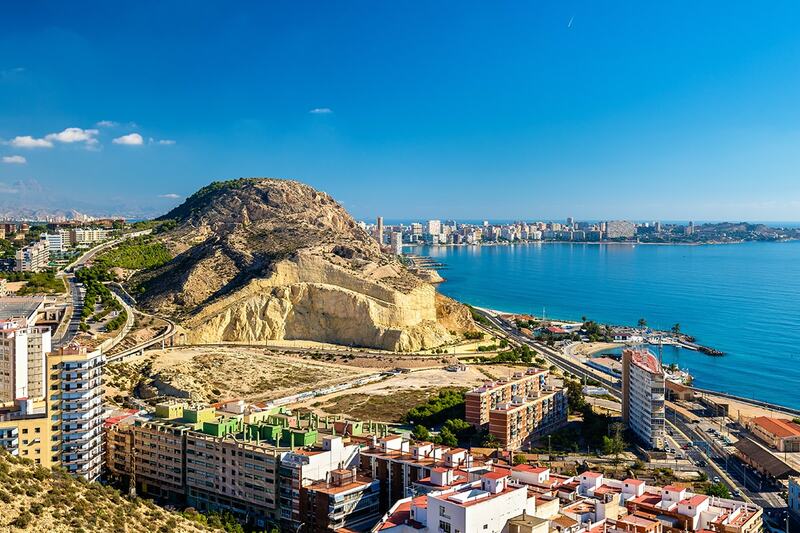 Although today’s Valencia is less prominent, it’s still an important city for large commerce exhibitions and trade fairs to be held in throughout the year. Upon arrival, we will visit Modernisme Plaza of the City Hall, Valencia’s Ancient City Gates and Valencia Cathedral, where the true Holy Grail is reputedly kept. The day is rounded off with a drive to Alicante. This morning we depart for the city of Granada on the plateau of Andalusia province. This historic city has been ruled by Visigoths and Moors. It became the last stronghold of the eight hundred year Moorish rule over the Iberian Peninsula, until in the 15th century King Ferdinand successfully expelled the Moors and united Spain. 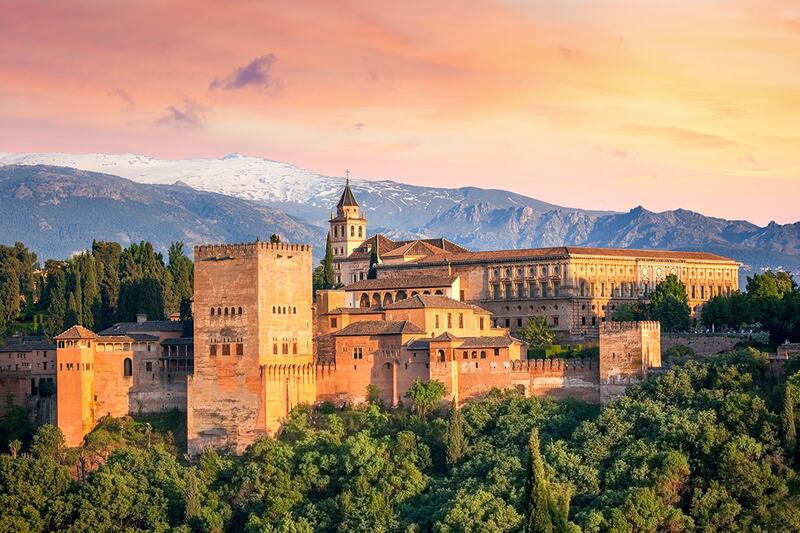 We will visit the Alhambra, a Moorish citadel and palace, also known as the Red Palace. Once you arrive, the Moorish legacy will catch your eye immediately. Representing the ‘golden age’ of Moorish architecture, the dome is stunning and delicate in construction. 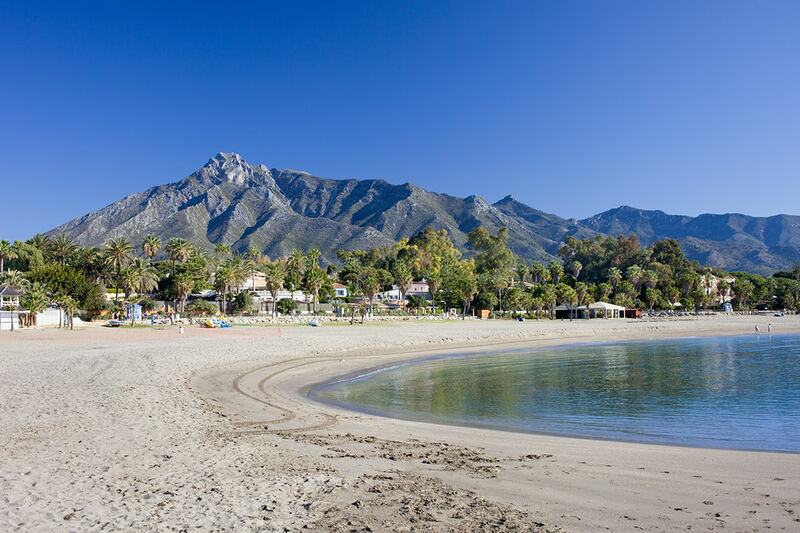 We proceed on our journey to Costa del Sol – the ‘Sunny Coast’ and go direct to our hotel overnight. In the morning we go north to the largest city of Andalusia province, Seville. 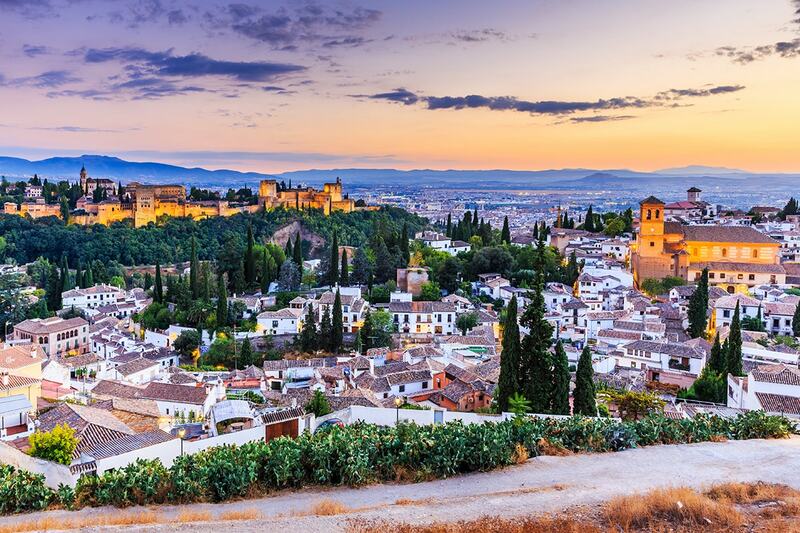 This city was the capital of the Moorish Muslim rulers, and is considered to be the centre of culture in Andalusia, and the birthplace of flamenco dance. Seville is the primary setting of many operas, the best known of which is Bizet’s Carmen. As the fourth largest city in Spain, it hosted the World’s Fair in 1992. Upon arrival, we visit Seville Cathedral, the largest Gothic cathedral and the third-largest church in the world. Completed in the early 16th century, the cathedral halls are now dedicated as the Royal Chapel, and the burial place of kings for over a century. Christopher Columbus, who discovered the New World, was also entombed here in recognition of the great navigator. From there we see the Alcázar of Seville, used to be a Muslim palace and later the Spanish royal palace. The upper levels of the Alcázar are still used by the royal family as their official Seville residence. This is the oldest royal palace still in use in Europe and was registered in 1987 by UNESCO as a World Heritage Site, along with the Seville Cathedral. Then we walk through the Santa Cruz, Torre del Oro (the Tower of Gold) and Maria Luisa Park, site of the 1992 World Expo. 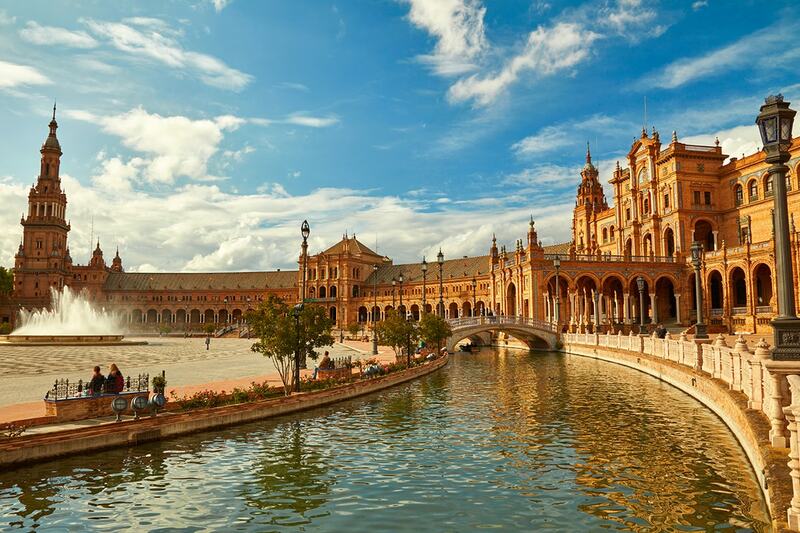 In Plaza de España (Spain Square), we can admire a crafted porcelain painting, detailing the history and elegance of old Spain. Today we depart for the capital and the largest city of Portugal, Lisbon. We are expected to arrive in Cabo da Roca (Cape Roca) which forms the westernmost point of mainland Portugal and continental Europe, in the afternoon. Don’t forget to buy a remembrance certificate! Later we return to Lisbon’s city centre and visit Belém Tower and Jerónimos Monastery, both UNESCO World Heritage Sites. 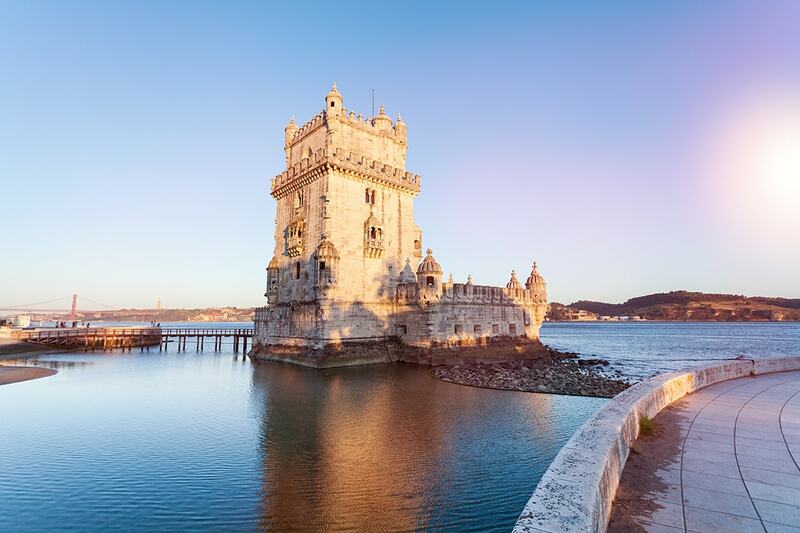 Belém Tower played a significant role in the Portuguese maritime Age of Discoveries. Jerónimos Monastery is one of the most prominent examples of the Portuguese Late Gothic Manueline style of architecture in Lisbon. 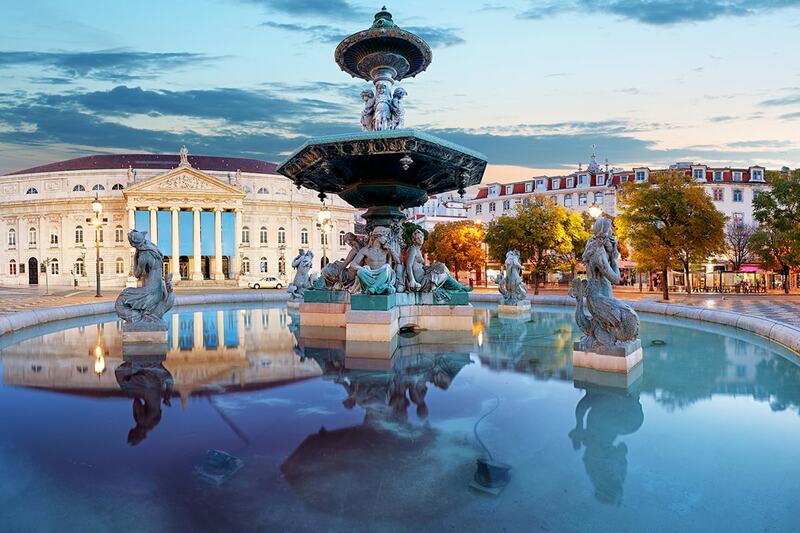 You will pass through Marquis of Pombal Square and then stop at Rossio Square for some free time. Those who are interested in Portuguese custard tarts can taste authentic ones at the century-old bakery. Today we will drive back to Madrid via Toledo, declared a World Heritage Site by UNESCO in 1986 for its extensive cultural and monumental heritage. This old city is located on a mountaintop, surrounded on three sides by a bend in the Tagus River, and contains many historical sites. 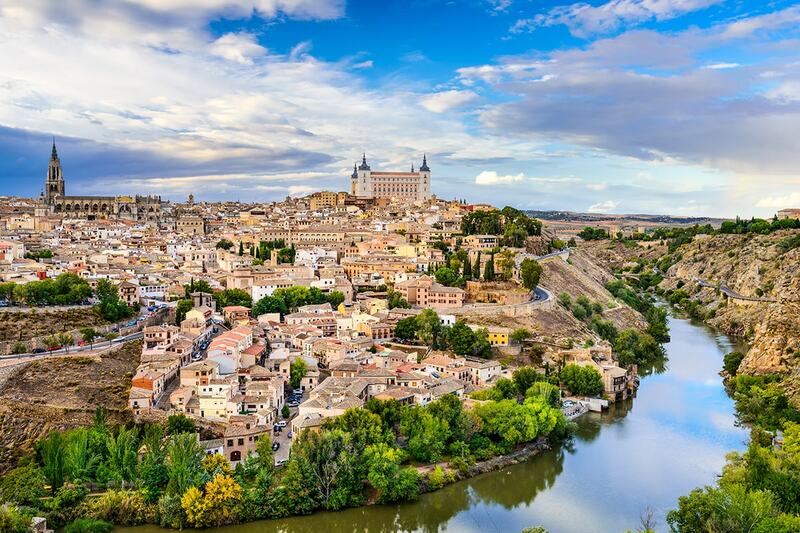 Strolling across the city, overlooking the Alcázar of Toledo and visiting the grand structure of Toledo Cathedral, you will feel the echoes of old Spain. 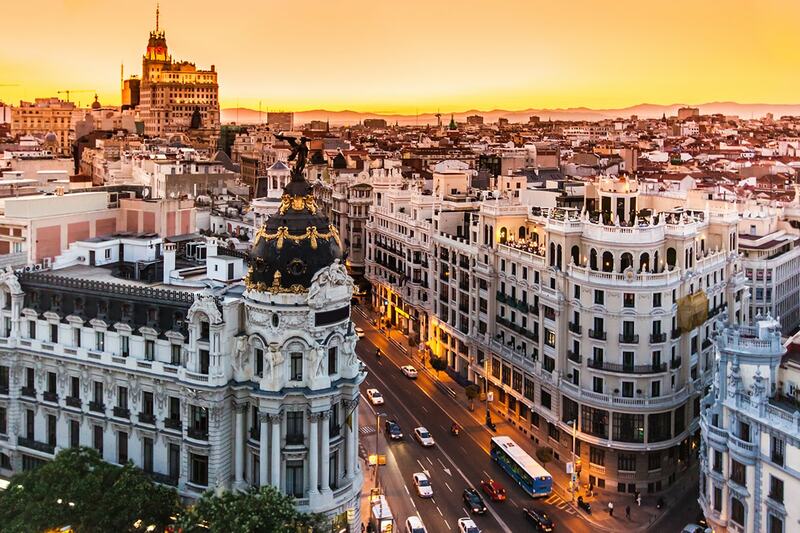 Then take a well-earned rest as you sit back and catch your breath, taking in the landscape of Spain and enjoying the rich palette of natural surroundings as you travel to Madrid. 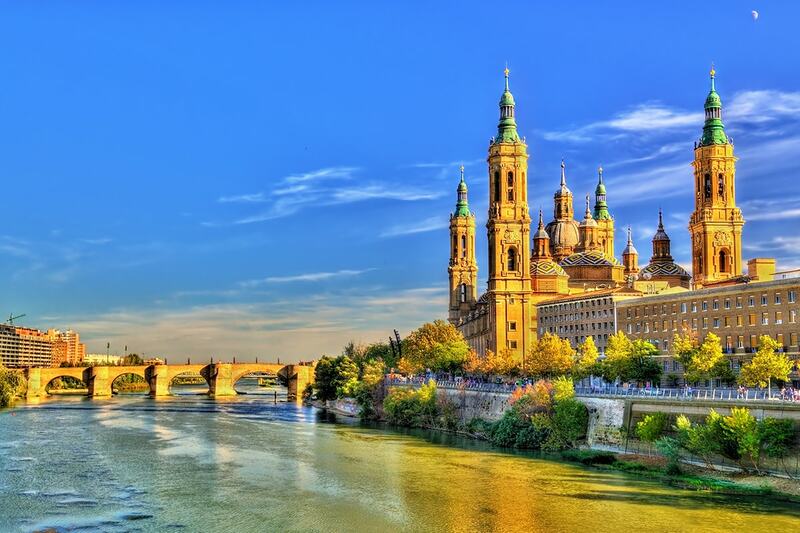 The Yellow Line tour starts from the capital of Spain, Madrid, where we will pass by the Cibeles Fountain, and then visit Plaza Mayor, Piazza di Spagna, Plaza de Colón and the Royal Palace of Madrid. 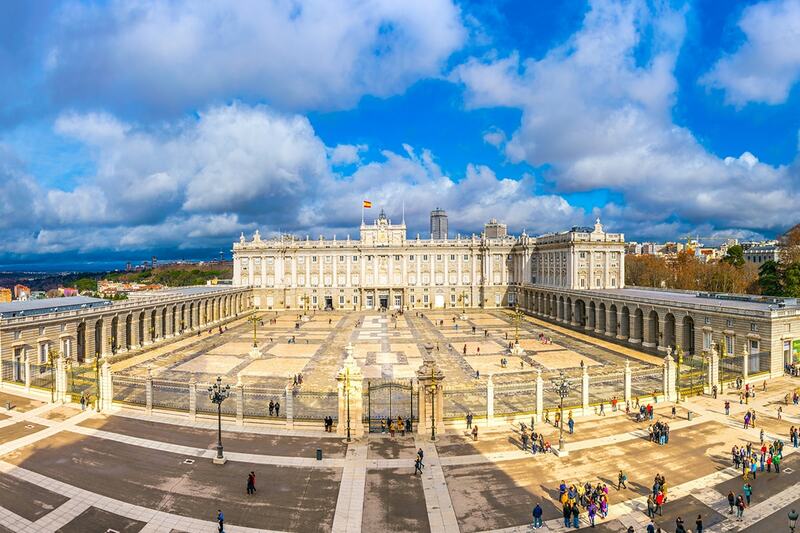 The Royal Palace of Madrid was built in the 18th century, and shows the magnificence and historical grandeur of the Spanish empire. Then you’ll arrive at the Puerta del Sol, a public square in Madrid. You can find the ‘KM 0’ tile in the pavement, indicating that the Puerta del Sol is the centre of the of Spanish road network. In the square, you can shop for speciality leather goods, clothing, and traditional Spanish souvenirs. In the afternoon, we say farewell to Madrid and head to Zaragoza to stay the night before heading to Barcelona. 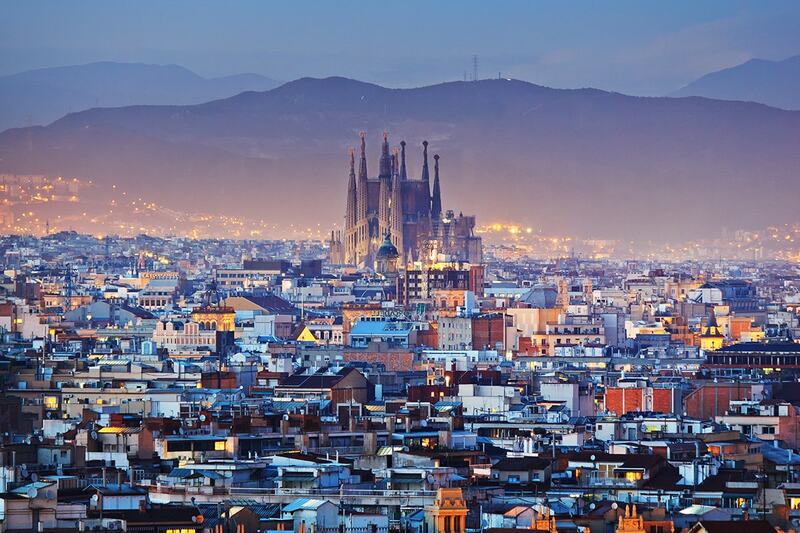 In the morning we drive directly to the warm and charming coastal city of Barcelona. After arrival we will visit the Columbus Monument and La Rambla, followed by La Sagrada Família, which is a large Roman Catholic church designed by Spanish architect Antoni Gaudí. Gaudí’s unique colours and fairy-tale architecture is seen throughout the city and makes the place feel like a fantasy in the artist’s mind. Then it’s on to Camp Nou, a football stadium which has been the home of FC Barcelona since completion in 1957. We’ll also visit Estadi Olímpic Lluís Companys, the main stadium for the 1992 Summer Olympics. The stadium is located on Montjuïc, a large hill to the southwest of Barcelona which overlooks the city. 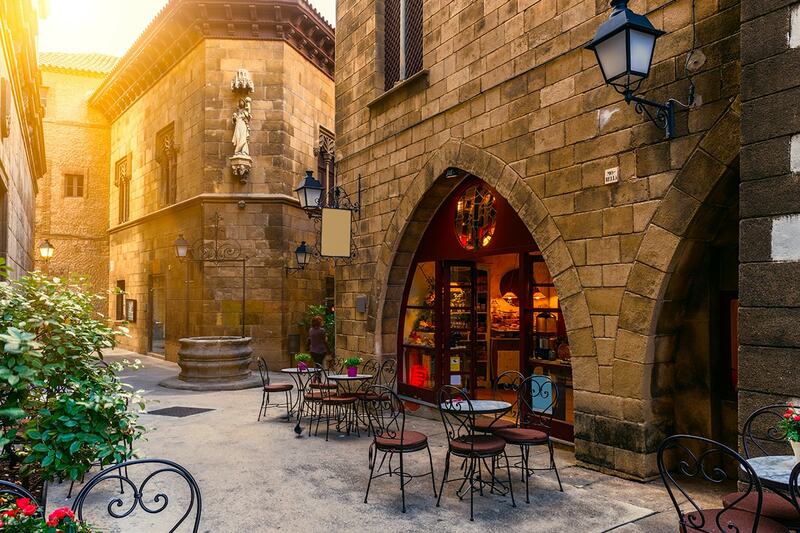 The remaining time is spent in the bustling Plaza Catalonia, where you have free time to do some shopping. Optional Tour: Entrance to Sagrada Famila Church. After breakfast enjoy the morning at leisure before you are transferred to Barcelona airport to board your overnight night to Australia. Choose from over 42 departure dates in 2018! In Portugal, you’ll reach westernmost point of continental Europe, then on to Lisbon to enjoy the famed custard tarts. PLEASE NOTE: No flight, staybehind or special requests will be actioned until your final payment is made. Tipping – A Mandatory tip for the tour manager and driver of €7 per traveller per day (€4 for the tour manager and €3 for the driver), which will be collected by the tour manager whilst on tour. $499 per person in addition to the twin share voucher. Payable at the time of booking. Optional tours are payable on tour direct to your guide. * Peak Season Dates – $300 surcharge per person applies on these dates. Payable at the time of confirming your booking. Adelaide – A $300 Interstate surcharges applies per person. Payable at the time of booking.